With the war with the Orcs behind them, the Kijin, Lizardmen, Goblins and Dryads all come together under one roof to hear what Rimuru is going to do about them. After all, he’s now the Chancellor of the Great Jura Forest Alliance…which is actually news to Rimuru! 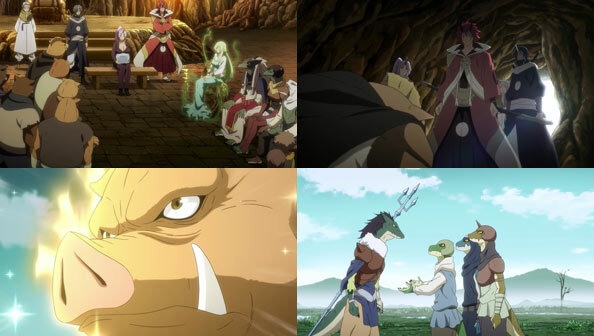 Improvising, Rimuru decides to not only fully pardon the Orcs, but integrate them into the alliance as a labor force in exchange for food and water from the Lizardmen and Dryads and shelter among the goblins in his town. Benimaru also forgives Geld’s son, as they’re all servants under Great Rimuru and thus no longer enemies. As for Gabiru, his newly-named and evolved father decides not to execute him, but merely excommunicates and exiles him from Jura. I was kinda hoping Gabiru would move to Rimuru’s village, but he and his groupies seem bound elsewhere. Once insufferably arrogant, he’ll be missed now that he’s learned some humility. Rimuru proceeds to name every one of the 150k Orcs, evolving them into High Orcs, and progress on his capital accelerates into fill SimCity Mode. But not all of Rimuru’s troubles are gone. 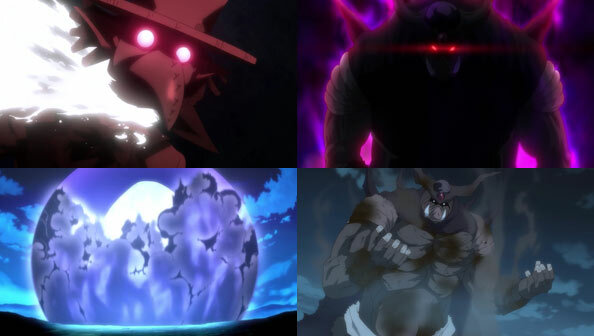 The Demon Lord Clayman has fixed his gaze on “the Slime” and intends to challenge him soon, while the Dwarf King Gazel Dwargo arrives in town at the head of a squadron of Pegasus Knights to take the measure of Rimuru via a duel. Rimuru, sporting some snazzy new threads, accepts the challenge, and Treyni serves as witness. Dwargo proves a formidable opponent, but Rimuru just manages to block his combo strike thanks to the fact they received instruction in swordsmanship from the same master, Hakurou…small world! 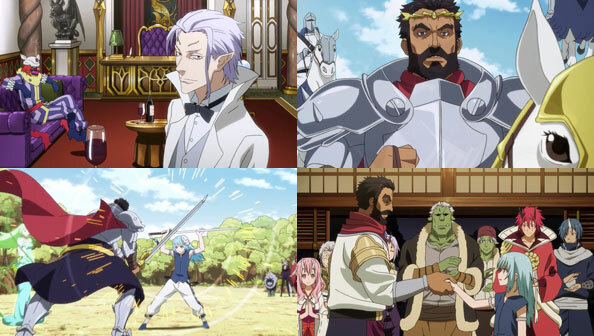 Convinced Rimuru is not evil, Dwargo and his men feast at Rimuru’s new facilities, and proposes an alliance between Rimuru’s new nation and his Dwarven kingdom. Rimuru accepts, but he has to name the nation: Jura Tempest Federation. Has a nice ring to it. As for the capital, his admiring underlings name it Rimuru in his honor. Here’s hoping Clayman and whatever other Demon Lords are lurking out there don’t mess it up too bad in the near future. Gelmud arrives to put the invasion back on track, but he wasn’t counting on encountering anyone more powerful than he, a superior majin. 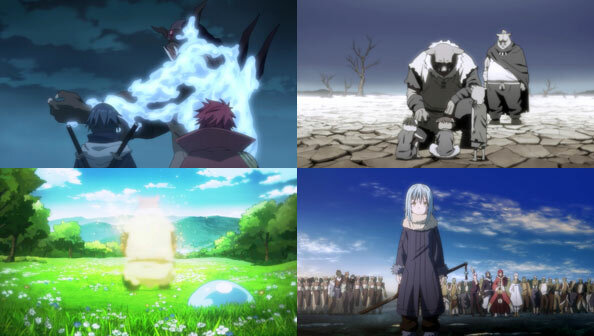 While he tries to kill Gabiru, who he himself named just to be another pawn to make his Demon Lord stronger, Rimuru steps in to deflect the relatively weak attack, then tosses some potions to Gabiru to heal his fallen loyal subordinates. Gelmud is little more than an annoyance; the one thing Rimuru wants from him is the name of the one pulling the strings, but Gelmud won’t give him up, confident Orc Lord Geld will attack on command (he named him out there in the desert, after all). Instead, the Orc Lord beheads Gelmud and eats him, after which he evolves into the Demon Lord Orc Disaster Gelmud was trying to create all along! The Kijin and Ranga throw everything they’ve got at the Demon Lord, all but exhausting their magicules in the process, but nothing can cause anything other than light scratches and burns, and he heals almost instantly. 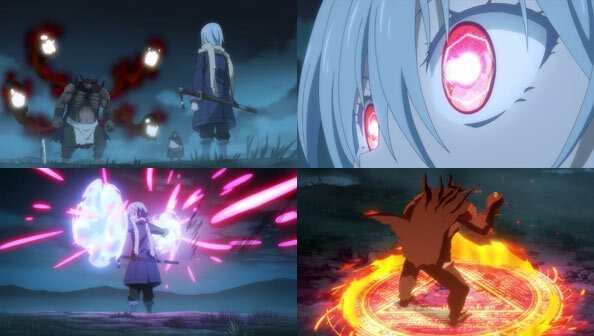 This is certainly the toughest boss Rimuru & Co. have faced to date. So tough, in fact, Rimuru decides to cheat a bit, by activating “Auto Mode” and leaving the Demon Lord up to the Great Sage and all her amassed wisdom. Rimuru’s eyes glow red and reflect the Great Sage’s geometric form, and starts to go to town on the Orc, culminating in enveloping it in a massive column of flame. Unfortunately, probably since he ate Gelmud, Geld has a resistance to fire, so the big attack has no effect. Rimuru takes back control and proceeds to Plan C…pivoting from Cheat Mode to Cheat Day, as in eating way more than he should. It becomes a struggle to see whether Geld’s Starved or Rimuru’s Predator can devour the other first. As Rimuru’s expandable slimy body envelops Geld, he can see a bit of the former Orc King’s past, when he had to pull off his arm to feed starving children under his protection during a horrible famine. He soon set out to find help, which is when he encountered Gelmud. Geld insists he can’t lose, because he must live to bear his sins and those of those who sinned on his behalf…but Rimuru ain’t havin’ it: this is an eat-or-be-eaten world, and Geld can’t win against him. At least Geld has a momentary rebirth when his barren home is transformed into a lush, green paradise before evaporating. 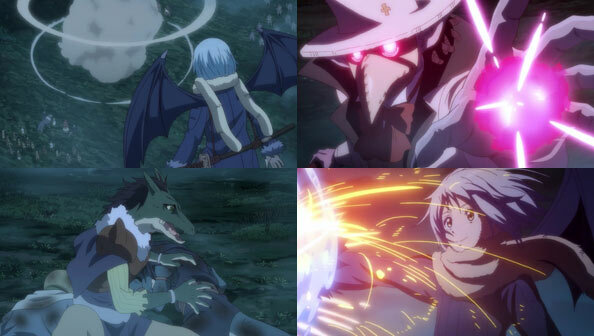 The Demon Lord Geld is gone, and Rimuru and his allies are victorious. He relieves the Kijin, keeping his promise to release them from his service once they took care of business…but unsurprisingly they all want to stay by his side. I’d say it was time for a celebratory feast, but I’d also say Rimuru’s eaten enough for one day! Try as Dororo might to communicate as he travels with his new companion, it’s pretty clear Hyakkimaru can neither see nor hear, at least not in the conventional sense. Rather, he depends on a different kind of “sight” in which he can see the souls of objects, and lets Dororo stay close because his soul’s color denotes him as non-threatening. 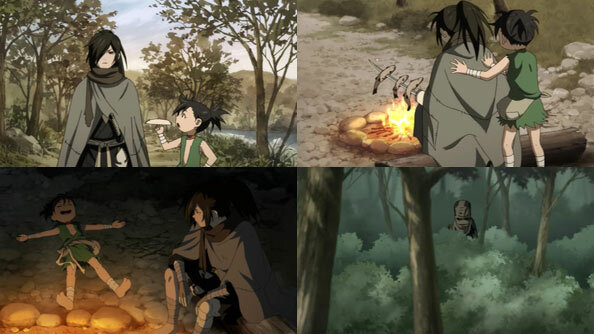 Dororo, in turn, starts a fire for him so he doesn’t have to eat the fish he catches raw. Between his adept fishing skills and ability to slice up demons, Dororo is sticking with this guy because he knows there’s both people to be saved and money made slaying monsters. One such apparent monster lurks in the forest, ringing a bell. Dororo and Hyakkimaru end up in a village, where Dororo does the talking, claiming they’ll root out the monster that’s harassing them. But something isn’t quite right: the village has too much money to throw around for guests considering they don’t seem to have rice paddies or any other source of such income. In the night, the bell-ringing monster appears, but Hyakkimaru won’t budge, which can only mean one thing: whatever that big-headed thing is, it ain’t a threat. The next morning the interim chief introduces them to Bandai, the bedridden chief. Dororo, being a little boy with eyes, is immediately smitten by the woman’s otherworldly beauty. Hyakkimaru…isn’t. He draws his arm-sword, and Dororo has to hold him back from attacking Bandai. Clearly, she’s the monster, but the villagers are protecting her. They toss Hyakkimaru and Dororo in a storeroom, where they meet an old blind priest, who explains to Dororo how both he and probably Hyakkimaru “see.” When the lights suddenly go out, Dororo becomes the blind one, while Hyakkimaru goes after a demonic limb that peeks out of a hatch. The hatch leads outside Bandai’s house, and Hyakkimaru busts in and recommences his attack. Bandai reveals her true form as a giant green demon, whose soul the priest senses as a blood-red; the most dangerous kind. Hyakkimaru chases Bandai into the bamboo forest, and eventually slices it to pieces and stabs it through the “woman’s” head. The interim chief confesses to having fed Bandai travelers who came to the village so it wouldn’t attack them. The big-headed bell guy turns out to be some kind of youkai that leads Dororo to the gold the village took from their eaten guests. Dororo reprimands them for being worse than monsters for letting one prey on others for profit. Moving on to their next destination, Hyakkimaru finally introduces himself to Dororo by writing his name in the dirt. Dororo can’t read the characters, but the blind priest can. The priest also recognizes Hyakkimaru as the poor cursed babe he encountered in the river. With the demise of Bandai, another statue in the Hall of Hell is cleaved in two, and Hyakkimaru gains another part of him that was taken by the demons: his nerves and thus his ability to feel pain. Considering the wounds he sustained in the fight with the demon, he ends up with a lot of pain. But at least he’s not alone; his new friend Dororo will help him in any way he can. It’s fun watching Dororo learn more about his new friend as we learn beside him, and as he gradually collects more parts of himself. The spunky kid is never not fun to watch. 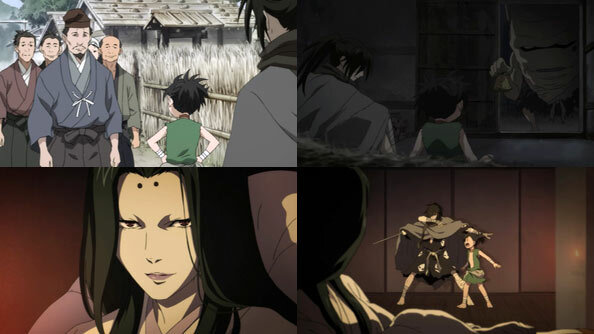 The show aptly balances the friendship-building with quick, brutal action once Hyakkimaru is in Go Mode. It’s also starting to look like with each part he regains, Daigo may lose a bit of the good fortune the demons bestowed upon him. Ah well…that’s why you don’t make deals with demons.